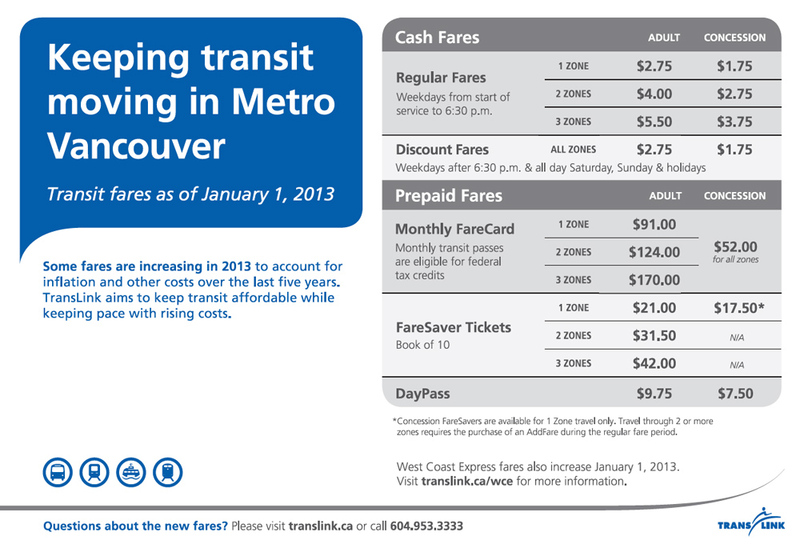 Fares for buses, Skytrain, and West Coast Express are going up at least 10% on January 1, 2013 to cover inflation costs. The price of a one zone ticket will increase by 25 cents to $2.75; two zones up 25 cents to $4.00; and three zones up 50 cents to $5.50. Discount fares after 6:30 p.m. and on weekends and holidays will increase to $2.75 from $2.50. A DayPass will increase to $9.75 from $9.00. Monthly FareCard passes jump to $91, up from $81, for one zone, $124, up from $110, for two zones and $170, up from $151 for three zones. Concession passes rise to $52 from $45.50. A West Coast Express adult one-zone monthly pass will rise to $151.75 from $134.75. A five-zone pass goes to $335.75 from $298.50. The price of FareSaver tickets stays the same. Fares make up 33% of TransLink’s revenue. In 2011, TransLink served 233 million rides; 14 million of these rides were delivered at no extra cost by moving existing resources to where they were needed most and serve more customers. TransLink has added or is adding 109,000 new service hours, including a new express bus service over the Port Mann Bridge and new B-Line service on King George Boulevard. TransLink’s service area is almost 3,000 square kilometres, making it one of the largest and most unique in North America. 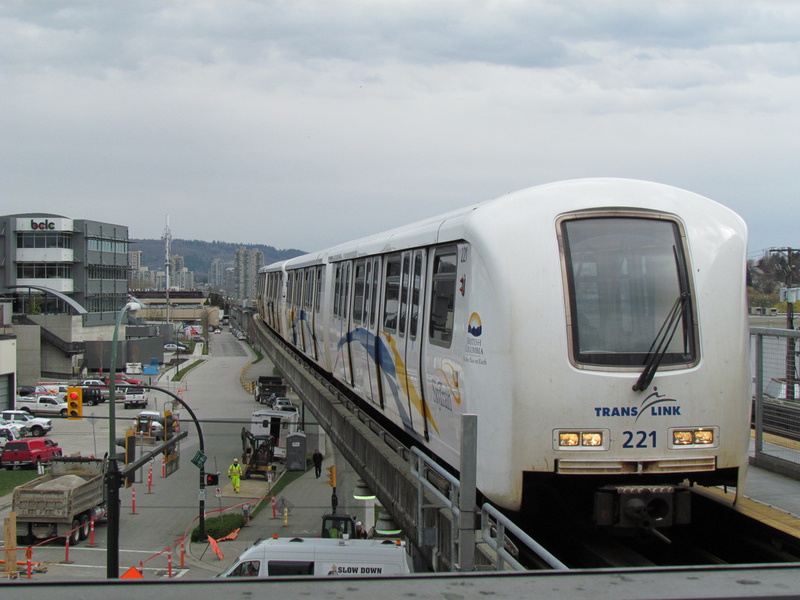 TransLink is the only transportation authority to provide an integrated network of services that traverses urban areas, agricultural land, protected greenspace, mountains and water. 80 per cent more rides have been served over the last decade with only 45 per cent more service. In the last three years, transit ridership has outpaced population growth—a 17-per cent increase in ridership compared to a six-per cent increase in population. As a result, transit’s share of all trips taken in Metro Vancouver has grown by 40 per cent over the last 10 years—from 10 per cent to 14 per cent.